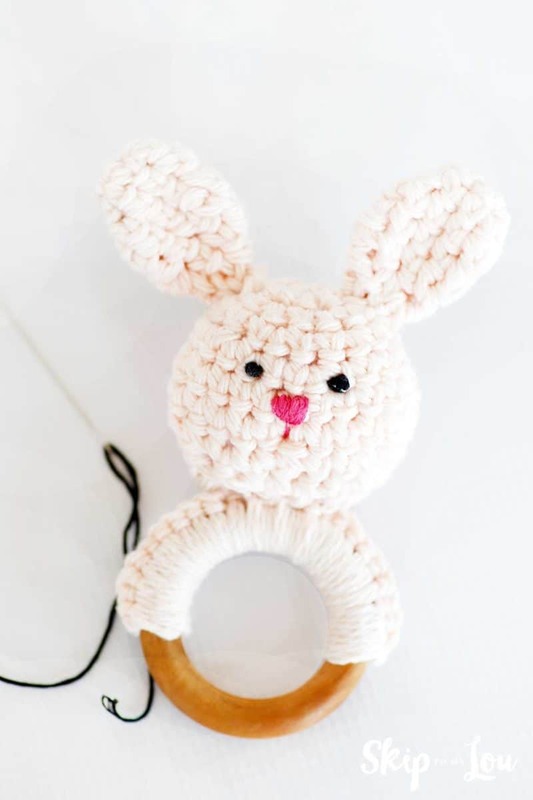 A crochet bunny teether makes an amazing baby gift. 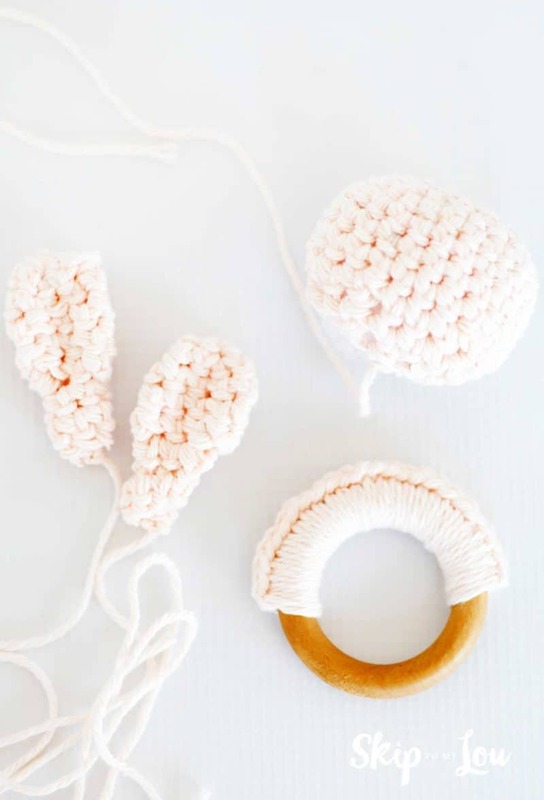 Just a little bit of yarn and a 2 inch wooden ring and you can whip up a lovely (and useful) gift. Making baby items are always so fun. I love this crochet baby blanket and these crochet baby booties. Start with a tail/slip knot around the hook, Make a loop in the ring, and pull up. Chain 1, make 25 single crochet in ring. Fasten off with a tail. Weave in ends of yarn on the wrong side of work. Round 1: Mr, 6 sc in ring (6 sts). Round 2: Inc in each st around (12 sts). Round 3: (Sc 1, inc) repeat around (18 sts). Round 4: (Sc 2, inc) repeat around (24 sts). Round 5: Work even (24 sts). Round 6: Work even (24 sts). Round 7: (Sc 2, dec) repeat around (18 sts). Round 8: (Sc 1, dec) repeat around and stuff (12 sts). Round 9: Dec around (6 sts). End stuffing. Leave a tail, weave in remaining 6 stitches and pull tight to close. Make a knot to end. The remainder of the tail will be used to sew to head. Round 2: (Sc 1, inc) repeat around (9 sts). Round 3: Work even (9 sts). Round 4: Work even (9 sts). Round 5: (Sc 1, dec) repeat around (6 sts). Round 6: Work even (6 sts). Round 7: Work even (6 sts). End off with a tail and sew to head. Center head evenly between stitches on the ring and sew head to the ring first on the right side of the ring, then secure with more stitches on back to reinforce and prevent wobbling. With black embroidery thread, in Round 5, make stitches for each eye. Eyes are about 3 stitches apart. 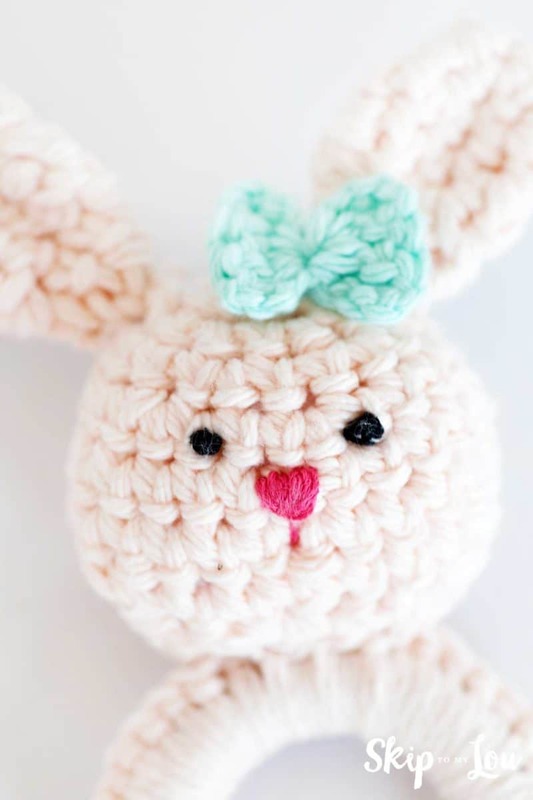 With pink embroidery thread, make a few straight stitches in triangular shape centered on the row below eyes. Make a small straight stitch lengthwise centered under the nose. Sew on the head of the bunny under one ear. TaDah! 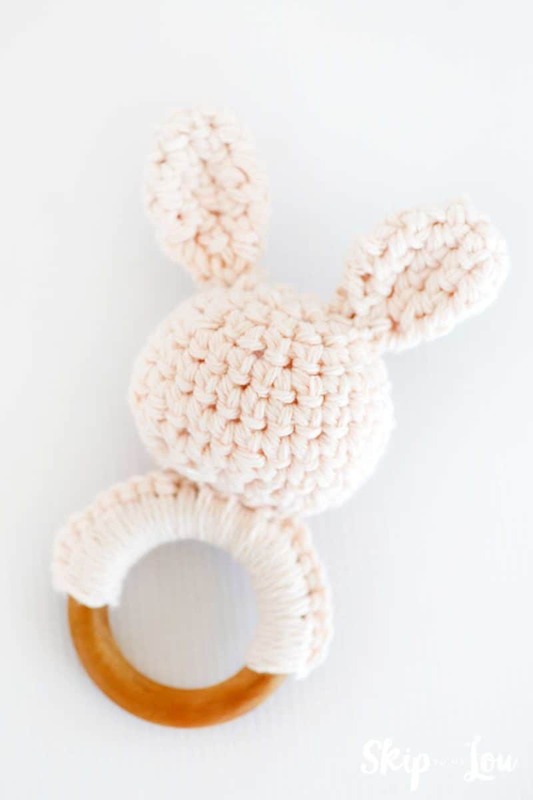 A sweet little teething ring for little baby teeth. 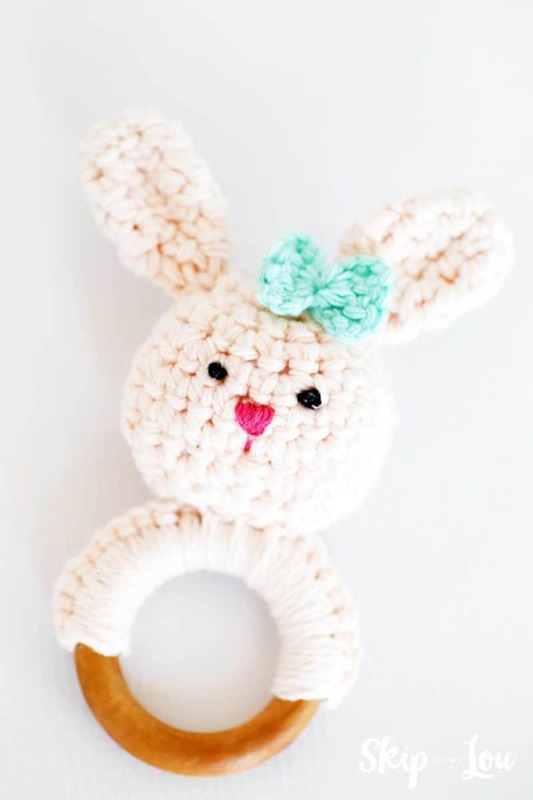 The above bunny crochet baby teether pattern is free, but enjoy a printable pattern for $1.99.